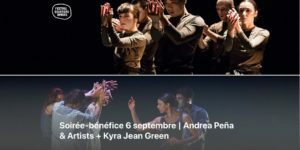 A Dance Gala organized by the Festival Quartiers Danses will take place on September 6th and will feature dancers Andrea Peña & Artists and Kyra Jean Green. This fundraising evening is organized in collaboration with our Foundation and it will start with a cocktail reception from 6:00pm – 7:30pm in the reception area of the Cinquième salle at Place des Arts which will be followed by the show at 8:00pm in the Cinquième salle. Tickets are $115 and you will receive a $ 25 donation receipt. The proceeds of this evening will go to help our colleagues who are being sued by the Collège des médecins du Québec and who are facing considerable fines. We ask you to inform your friends and family about this event since the profits will go towards helping our colleagues and will be greatly appreciated by them. Please choose the option “Benefit evening (dance) September 6”. You will be automatically registered on our list of special guests and will have only to present yourself at 6:00pm at the venue. In order to ensure your place at the cocktail party, please register before August 15, 2018.